I’m reasonably conservative and crafting such a bold title could become hazardous to my reputation but before you dust off the straight-jacket and have me committed, take a few moments and consider the possibility. I’m a contrarian, and I thoroughly enjoy technical analysis. I spend thousands of hours every year studying charts and scrutinizing data. To be profitable one must methodically scan the various industries, sectors, and an endless amount of price charts, looking for an investment bounty without bias. In my opinion, physical silver offers a unique opportunity that seldom appears. I’ve been a tremendous fan of silver for over a decade, and before we proceed I’d like to review a few facts regarding this very special precious metal. Silver is indeed precious, grouped with the likes of Gold and Platinum; I think we often forget. Silver has the highest thermal conductivity of any element. Silver has the highest reflectivity of any metal. Silver is rare, naturally occurring “abundance in the earth’s crust” at just .075 ppm, compared to Aluminum, which occurs at 82,300 ppm. Silver has many uses including Electronics, Medical applications, Water Purification, Batteries, Solar Technology, Industrial Catalysts, Nanotechnology, Photography, and Jewelry. It’s impossible to know just how much silver exists above ground, but it’s widely believed stockpiles have dwindled significantly over the last 50-years due to ever increasing industrial applications. Silver and most other commodities have a distinct cyclical presence; precious metals follow an 8-year cycle that tightly parallels the US Presidential election. The correction starting in 2011 has exhibited 12+ Month consolidations, and then prices break sharply lower (circles 1, 2 and 3). Our analysis supports prices breaking for a third time ultimately leading to what will become the 8-year cycle low and an incredible opportunity. 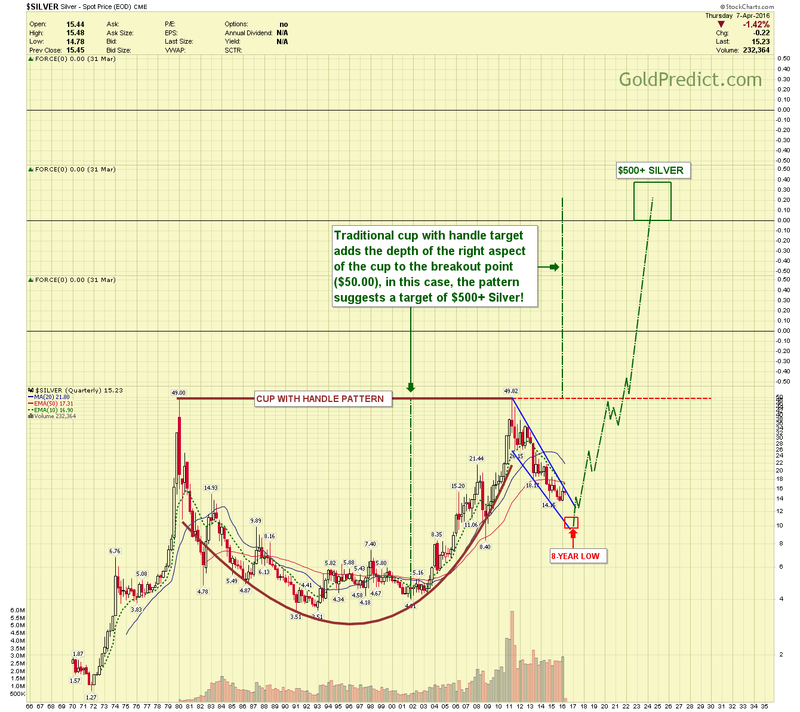 The Big Picture (quarterly) chart of silver depicts an enormous cup with handle formation. A traditional cup with handle structure adds the depth of the right aspect of the bowl to the breakout point ($50.00), in this case, revealing a $500 Silver price target! Note: The pattern’s handle is retracing slightly more than desired, but overall it has developed nicely. A breakout above $50.00 will trigger the pattern and become incredibly bullish. Is $500 silver realistic? On the surface, it seems absurd, but I challenge you to examine things in a different way. Consider everything it takes to produce just one ounce of silver or you could grab a shovel and start digging for silver in your yard (not recommended). Imagine shoveling, washing, and processing tons of material until you had enough for a 1-ounce coin, and then refine that to its purest form. Would all that effort, time, equipment, material, and expense be worth producing a coin that sells for $15.00? Probably Not! Silver and Gold are commonly referred to as a store of value; I believe they are better reflected as a store of labor. How much time, strength and capital outlay goes into producing 1-ounce of pure silver, and is that arduous undertaking worth it? A person could spend several days prospecting, digging and panning through rivers and streams hoping to find a few grams of precious metal or he can work a 2-hour shift at McDonalds, with minimum wage at $7.49/hour and then buy one ounce of pure silver (current silver price $15.21). Is silver cheap or is minimum wages too high? Investments and sectors vary in performance while one is rising others are falling. A Wise Investor explores asset classes that are undervalued, holds them until they become overvalued and then liquidates them for the next cheap and underappreciated investment. There is nothing more exhilarating then stumbling across an asset that is insanely undervalued and that very few are talking about. 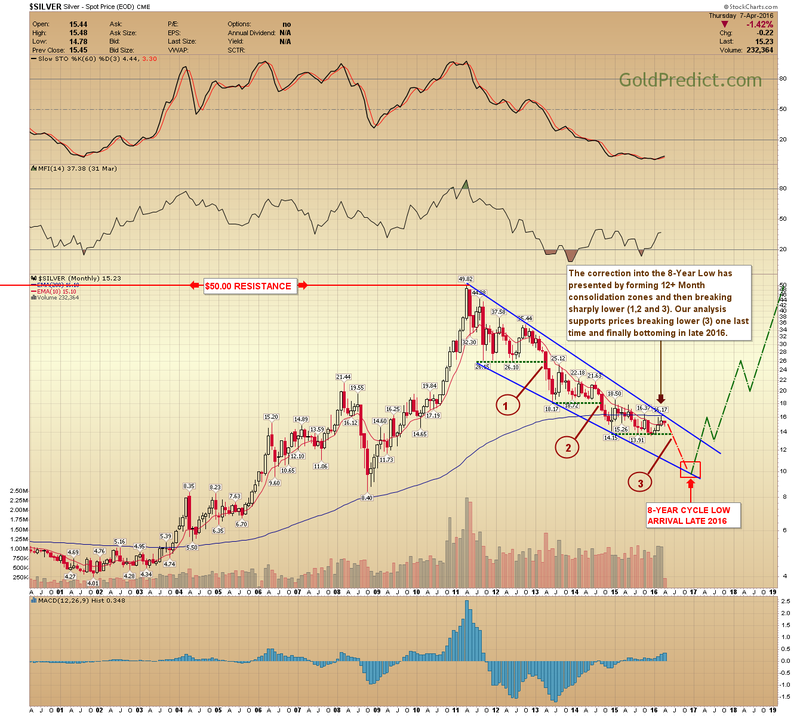 For frequent and timely analysis Become a Member, and receive access to the current Gold Predict Color Code.